Why role-playing in Tamriel and the Wasteland is sometimes better than not role-playing at all. In a word, Conner Smith was slimy. Equal parts cunning and greed, he was a con man who would do everything in his power - short of killing - to stockpile huge numbers of caps and bankroll his way across the Mojave in search of even greater riches. He would never spend money unless he had to, and he would never go as far as stealing, choosing instead to talk people out of anything he needed. Rarely did he ever need to draw his only revolver - which was good, because whenever he fired it, he usually missed. To be honest, if it didn’t involve talking people out of their caps, chances are he wasn’t very good at it. 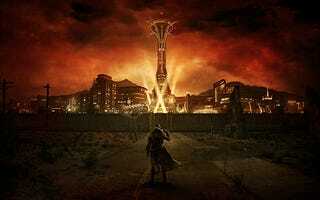 Word was, he’d even managed to talk his way into New Vegas. But after a while, Conner started acting strange. He started getting sloppy. He got himself a V.A.T.S. to make up for that bad aim, and the people he would otherwise be conning were soon finding themselves six feet under without ever having been engaged in conversation. It was almost like Conner knew who had the most caps, as if somebody above was telling him who they were and how much they had, and he was tearing through the Mojave (now with an upgraded lasgun) on a greed-fuelled rampage. Pretty soon, he was the richest, bloodiest man in the Mojave. And then one day, he disappeared. Conner is just one of the many characters I’ve started in Fallout: New Vegas, and just one of a handful who were designed with role-playing in mind. Like most of those kinds of characters - from Fallout, The Elder Scrolls, World of Warcraft, and Dragon Age - Conner eventually failed because I am simply awful at role-playing. While I feel I do okay in the creativity department, when it comes to the process itself, my impatience and poor attention span contribute to increasingly frequent character-breaking, leading to the eventual abandonment of the save file after an irreparable killing spree (or equivalent). And but while keeping up the act is something I struggle with even at the best of times, over the past little while I’ve learned to value the process of role-playing in digital worlds. Making the effort is at times hugely rewarding, in that it causes us to naturally stumble across game elements that would otherwise remain unknown. Although I’ve been playing RPGs for years, I didn’t start capital-R-P role-playing until quite recently. My tried-and-true approach to these kinds of games was beginning to feel so incredibly lame and financially-irresponsible that I figured a drastic change in my approach was all-but necessary. This approach, which I took to games such as Final Fantasy VII-thru-XII, Red and Gold Version, and the Fables, was to pick a big gun, go hard, and smash my head against the core game until it was done - and all without even glancing at the scenery, of course. To wit: nine-year-old me never overwrote the tackle move on his Venusaur just so that, with that lone highly-levelled Pokemon in his party, he was able to beat the Elite Four and Blue without having to switch out to other Pokemon (and by “Pokemon” I mean “useless HM slaves”). In that first Skyrim playthrough, my vast intellect and imagination led me to the standard sword, shield, and heavy armour build which of course allows one to effectively ignore most skills, any form of class-mixing, and general fun. In Dragon Age: Origins I got myself a fire mage because of that one completely overpowered one-button-kill-everything-ever nightmare death kill satan flame tornado move. The point here is that I threw myself through these games without a second spent trying to engage with either story or game elements that would require me to do any of that gosh darn brain-thinkin’. I was an action-button-hammering, dialogue- and cutscene-skipping piece of human garbage, and looking back on things, I feel like I’ve never really played a lot of the RPGs whose main questlines I completed. I mean, I don’t even know what happened in The Witcher 2, but I definitely saw those credits. And so the role-playing thing. Everything I talked about in the above were things I have always been acutely aware of: as in, I have always known that I play RPGs pretty lazily and therefore I don’t get the kind of ‘big’ experiences these games are ostensibly designed for. It’s certainly made me feel guilty, this knowledge that my inability to commit to and truly experience content was leading to my missing out on massive chunks of game (especially in titles I might have forked upwards of eighty fun-bucks on). And while going full role-player mode wasn’t entirely necessary, my thinking was that an approach as full-on as this would require me to engage with games on a much deeper level and therefore take notice of the things I would otherwise sprint by without a second look. While the real me wasn’t going to take notice of everything in the game, maybe a character invented by me would. The process, I think, on paper, really isn’t all that complex - something to which I’m sure experienced role-players will be able to attest. It’s simply a matter of experiencing a fictional world from the perspective of a character one has created for it, as opposed to experiencing a game system from one’s own perspective as a player, which is how most of us are used to approaching our games. When we engage in role-playing, character creation might start before we load up the game (perhaps via actual pen-to-paper note-taking), and we might spend time thinking about what it makes sense for our character(s) to do before each game session. It’s certainly a more time-consuming approach, but by-and-large it’s hardly a complex one. What’s difficult for me (and others, maybe) is circumnavigating the aspects of my own personality which work in opposition to this approach. Most of my role-playing experience has so far taken place in the worlds of Tamriel and the Wasteland, fictional places rendered in The Elder Scrolls and Fallout series’, respectively. On the surface, worlds such as these - with their innumerable nooks, (until recently) silent protagonists, and mountains of lore/backstory - are perfectly-suited to the role-playing approach. Their relatively brief, linear opening sequences are generally the only things that force us into the main story - which is otherwise fairly easy to avoid (if necessary). These games strike a great balance between other single player worlds like those of Fable and Dragon Age, which, while allowing you to shape your own personality and look, inevitably funnel you into the story the game wants to tell, and the “virtual worlds” of World of Warcraft and other MMOs, which, while allowing you to forge your own tale, don’t make you feel incredibly special, since no matter what you do, a million players have probably already done it. An added bonus with Bethesda’s titles is that (on PC at least) we can mod the tutorials, starting sequences, and other story-enforcing elements out of the game entirely, thereby allowing for our new characters to be born with completely blank slates. In my experiences experimenting with role-playing on various titles, I’ve found the worlds of the Fallout and Elder Scrolls series’ best at striking a balance between open and funnel-shaped - I’m very clearly special in some way to the NPCs, but I’m rarely forced into performing certain actions or feeling a certain way about stuff (although I can’t speak to Fallout 4 because I’m about thirty minutes in). And even when I am, a course-correcting mod is usually only a couple of clicks away. And so the difficulties inherent in the process. Role-playing is all about experiencing the world, and making careful decisions based on what our characters would do as opposed to what we, as players, may be instinctually inclined to do. So therefore, even if I were to invent an impatient character, I would have to spend time thinking about what how his impatience would cause him to act - would he guess the right path instead of asking for directions? Would he steal instead of hunt? Would he kill instead of barter? Would he sit down to pee? The point is that it would involve a lot of pausing. And so the fact that I myself am impatient, and have allowed that impatience to seep into most of my RPGing up until recently, I’ve found it incredibly difficult to just set the controller down and think. For others, it might be curiosity - the desire to see what’s inside the cave may trump the wishes of an invented character who is prejudiced against all types of naturally-formed shelters, for example. For some, the desire to see what a certain character model might look like disemboweled may surpass our character’s desire to be the most polite and charming knight in all of Tamriel. The point is, there’s always going to be something about ourselves in the way of role-playing, and for me, it’s impatience and poor concentration. Conner was the most recent tragedy - and by “tragedy,” I mean “deletion of a completely irreparable save file.” Sure, I could have “written in” some kind of radiation sickness that led to the massacre of fourteen innocent people just to get to 900 caps (before bed), some of whom were just new NCR recruits checking what all the fuss was about, but doing that just felt wrong. Like the wasteland scavenger with a fear of people and the racist gambling addict before him (both of whom transformed into bloodthirsty psychopaths as the resources dried up), the best thing to do with Conner was to delete him, and try again. And quit and try again I did. A bunch of times, across both Tamriel and the Wasteland. Just the other week I started a guy named Fred in Fallout 3 who was once a fierce bare-knuckle boxer in the illicit gambling rings of Vault 101 but who finds himself terrified by the unfamiliar surface world. Ten minutes after leaving the vault, I stumbled upon a piece of the game I’d never seen before while running away from a mole rat. And there’s Valeria, an alchemist Nord who brews potions for the sole purpose of finding new and interesting psychedelic experiences, and whose hunt for rare ingredients has taken her right across the land of Skyrim. And that’s the point, really. When we role-play our pants off - when we make the effort to act instead of play, we do things we wouldn’t otherwise do, which often allows us to uncover parts of the game we wouldn’t otherwise experience. And to a similar extent, it allows us to interpret things we’ve already seen in a totally new and different way. For those of you who have never given it a shot, I implore you to try - it can be very challenging at times, but the fact is, you’ll never be as bad at this than I am.